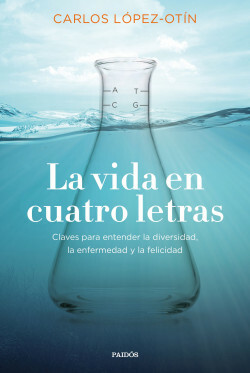 Carlos López-Otín, one of the most internationally renowned Spanish researchers, presents a major work of popular science devoted to explaining the secrets of the origins of life, the human genome, and humanity’s tireless struggle to overcome disease and achieve happiness on earth. Departing from an extremely difficult moment in the author’s life, this book begins with a fascinating question: is happiness written into our genes? Following this question over the course of fourteen chapters, López-Otín presents key moments in the history of life on earth, explains how we’ve gotten to where we are and why a series of adversities led to the existence of disease as an eternal threat to happiness. In doing so, he guides us through the language of the human genome and accompanies us through such amazing discoveries as those of Watson and Crick, who discovered how the origins of life were written into DNA through a molecular code of four simple letters that designate four chemical components: A for adenine, C for cytosine, G for guanine, and T for thymine. Finally, the author proposes his imperfect genomic formula for happiness, and reveals how beyond the messages written into our genes, there are other dynamic and fascinating biological languages that depend on our interaction with the environment and teach us unexpected lessons.